Reliable Ropes & Twine manufacturers since 1856. Manufacturers and suppliers of 16 plait braid, waxed or un-waxed cotton sash cords and solid spiral braid cotton sash cords. Our cotton sash window cords are usually ecru/natural colour, cotton sash cords are also available in black and other colours. Lengths of 10, 25, 50 and 100 metres, labelled Everlasto brand and shrink wrapped. 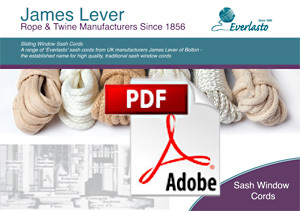 James Lever are UK manufacturers and suppliers of a range of sash cords under our brand Everlasto. The sash cords are manufactured from both natural and synthetic yarns to produce natural cotton, waxed cotton, jute, nylon, polypropylene and polyester sash cords. Sash cords are available in 10, 25, 50 and 100 metre lengths on either a hank or reel, labelled Everlasto brand and shrink wrapped. James Lever can also manufacture/package sash cords to the specific requirements of customers including own brand labelling. Everlasto Weather Proof Sash Cords - Britains's No1 seller. Copyright © 2015 James Lever Ropes & Twines. All rights reserved.